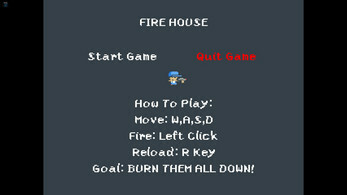 Fire House is a top down shooter with endless waves of evil furniture! After completing a wave you can choose between random power up that will help throughout your journey. This game was made for the 2018 ShenaniJam, for the "Burn It Down." Please comment your thought and score below! Game made in about 48 hours by one person. Everything but the SFX were created by me. The character had a base animation I made pre-jam. The movement/firing system was also created pre-jam as well. -Under estimated time needed to accomplish the look.Envisioned other house objects in the back ground to give the player more depth and obstacles. Art ability is limited, easier/simple settings will work best in the future. -Used gamemaker built-in collision detection, which saved an enormous amount of time. But this does create bugs if objects are being pushed into places they shouldn't be by another force(ie knockback). While this does save time, a hand made collision "package" for the next jam will allow more dynamic gameplay. -Lack of scripts. I found myself repeating code quiet often, because I didn't want to take the time to write a script. This would have saved time and perhaps made it easier to create more enemies. -Window sizing. For this game I had a small window stretched into full screen. This created weird and unreliable "display width/height" and made GUI placement a guessing game. In future, figure out an optimal way to stretch to full screen so GUI isn't a nightmare. -GUI/HUD wasn't fleshed out fully. Could have used graphics to display fuel and some depiction of what current power up the player has. The HP bar needed more polish to fit in with the other art in the game. -The Balance of the game isn't too great. Anything after wave 5 is a toughie, needs more focus on balance and making triumphant moments for the player. -Creating a simple base for character animations a head of time. This helped create the character animation quick on the fly. Having a bigger library of templates would help in the future. -The movement/controls are very fluid and responsive. This is certainly a good foundation for a top down shooter. The code is also allows flexibility enough to add many layers of difference mechanics. -Sound effects were pulled from the internet. As I believe they fit and sound half way decent, I would like to create unique sounds. Some of these could be made a head of time. -The only music track was made by myself. Achievement! While again it is half way decent, it isn't optimal and maybe having a better library or finding a good selection of music will save time and have better results in the future. -Sometimes Max Fuel increases when selecting a different power up. I could not put my finger on why this was happening. A deeper look is needed to get this one ironed out. -Please comment if you find any other bugs! It's a nice game with a funny theme. Playing is fun too, especially after you get some power-ups to your flamethrower. Controls work really well and fluidly. But yeah, could've maybe used some work on the level visuals. I'd like to invite you to take part in our Game Development World Championship!